oFishing Norfork Lake is starting to get real exciting. The fall bite is improving every day and will get better and better as the water cools. The lake is dropping roughly a 1/2 degree a day with this current cool front and I am looking forward to the lake surface temperature reaching the 60's. All species will become very aggressive and start to feed heavily for the upcoming winter months. I am starting to find large schools of feeding fish and they will attack anything that comes in front of them. Striped bass fishing is finally starting to improve. I am finding schools, as well as, scattered fish feeding on the bottom on large flats. 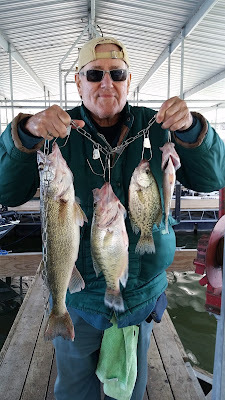 I have been fishing several different flats from the mid lake area up to the Red Bank area. Today was a little slow with the high pressure arriving after the cool frontal system arrived the other day. 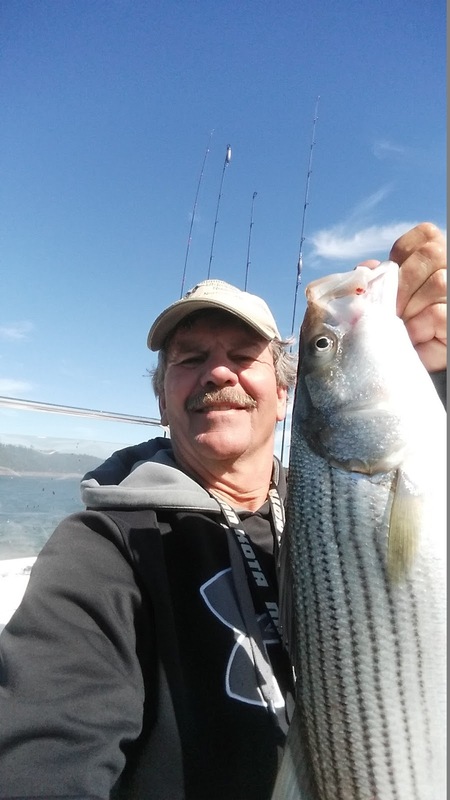 I did manage to find a really nice 31.5 inch striped bass on the bottom that gave me quite a battle. I don't think he knew he was hooked until he saw the boat, then the excitement started with one run after another. Very healthy and energetic 12 - 13 pound fish. I gave him his freedom at my dock after the photo. During the last full moon there was a very early morning (in the dark bite), but recently my bite has not started until almost sunrise and I am finding feeding fish all the way up to noon or a little after. I use my electronics to find the bait fish then I start jigging a spoon off the bottom. Today was a little slow, but the large schools will become increasingly more common as the water cools. Live bait is working very well, either thread fin shad, gizzard shad or shiners. 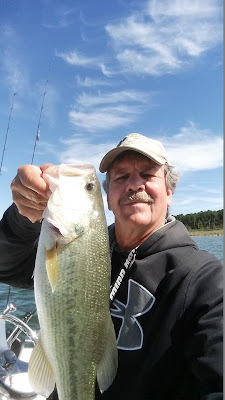 I am still using a down line for my live bait with a 1 - 2 ounce weight, a 3 - 4 foot leader and a small #4 size hook. A larger hook should be used if you have the bigger gizzard shad. Match the hook size to the bait. I have mainly been vertical jigging with a 1/2 to a 3/4 ounce spoon. All colors seem to be working as long as the predominant color is white, but as you know, my favorite color is white with a chartreuse back. 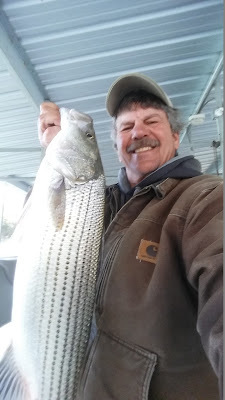 Feeding along side of the striped bass are the hybrids, white bass, largemouth bass, spotted bass, walleye and catfish. You never know what you are going to catch when you are jigging a spoon. I think this is why I like fishing this method so much. Crappie fishing is still good. Find brush in 25 - 35 feet of water and the fish will be on the top of the brush or buried inside of the brush. In the late afternoons the fish may come up in the water column to the warmer water so start dropping your bait down about 8 feet and keep checking deeper until the fish start to bite. I have been using a small 1/4 spoon in white/chartreuse, but other colors will work. Small grubs tipped with a minnow will work very well or just use a minnow with a slip float. The bigger white crappie are finally starting to move into some of the brush. 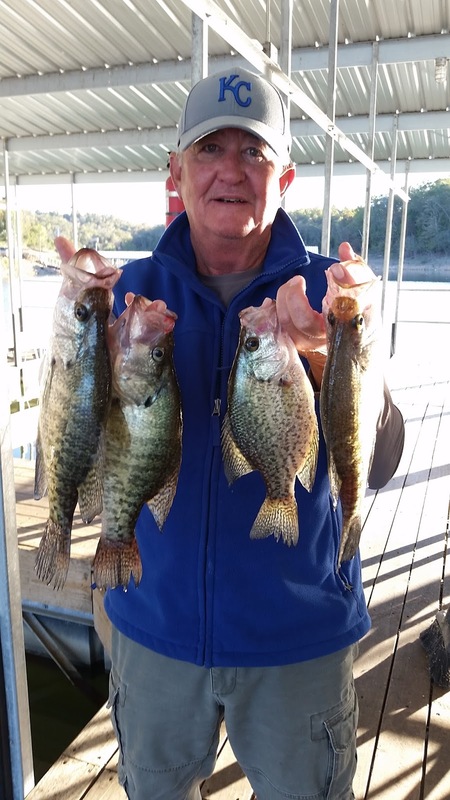 Several 13 - 15 inch crappie have been caught recently but most of the crappie are in the 10 - 12 inch range which is a great size to clean and eat. Bass fishing continues to be pretty good. I have done exceptionally well a couple of days. While striped bass fishing on the flats my guests and I have run into large schools of feeding largemouth bass and spotted bass. These have not been the little guys, all have been in the 2.5 - 4+ pound range. I have found these fish in about 30 feet of water at all different times of day, from just after sunrise to 2 in the afternoon. Other areas to check out are along bluff walls using jig & pigs or Texas rigged worms. 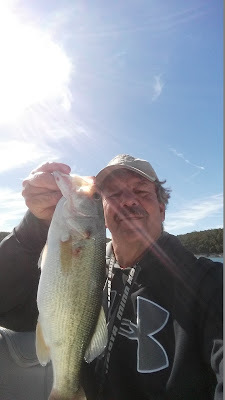 I had some bass fishing guests in last week and they had a blast catching topwater bass up on the Missouri side of the lake. 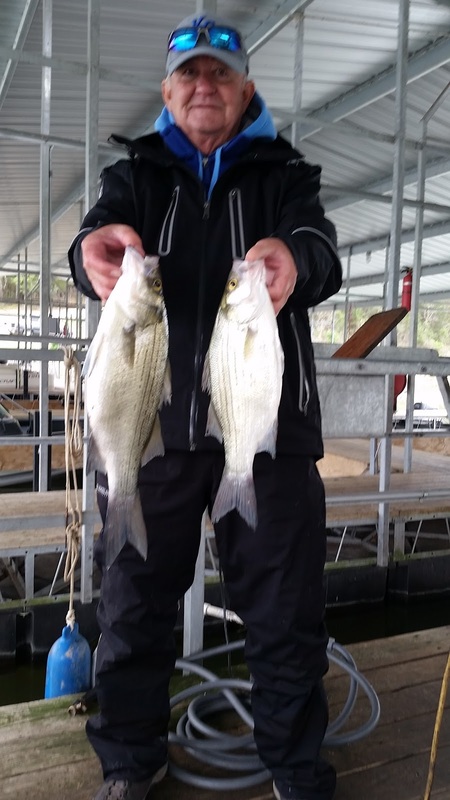 They caught a lot of short fish, but some keepers were in feeding with the little guys. Crank baits are also producing a lot of bass, but many are short fish. Norfork Lake level has been stable for the last week and is currently at 553.44 feet above sea level. Sporadic power generation is being used to maintain this level. The current level is a little under normal seasonal pool. The surface water temperature this morning was 73 degrees and the lake temperature is falling slowly due to the current cooler weather. The main lake is clear to partly stained and the creeks and coves are stained. 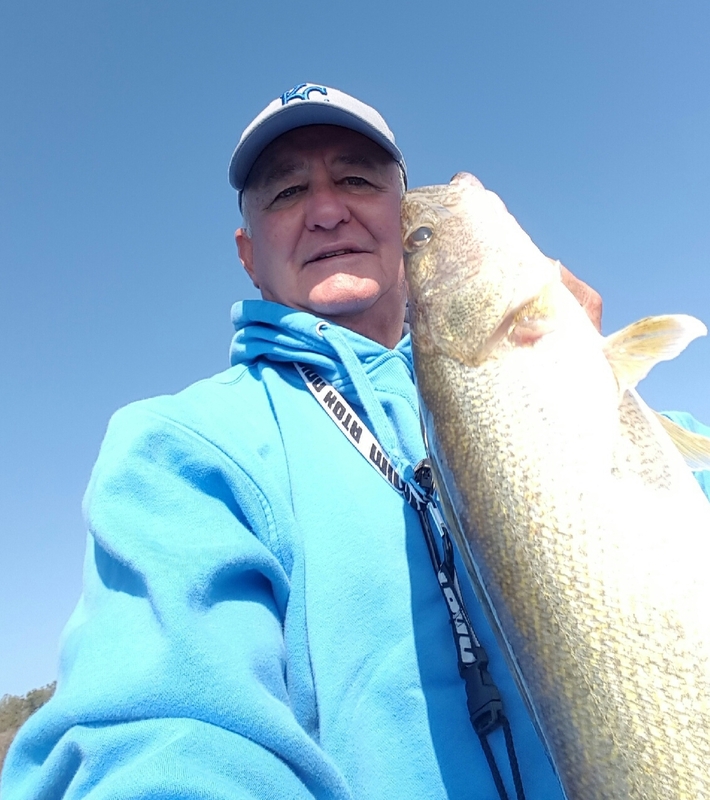 Great fishing conditions for all species and a perfect time to take that much needed lake fishing vacation.